President Trump's budget director claims the Obama administration was "manipulating" jobs data. Mick Mulvaney told CNN's Jake Tapper on Sunday that he has long thought the previous administration framed data to make the unemployment rate "look smaller than it actually was." 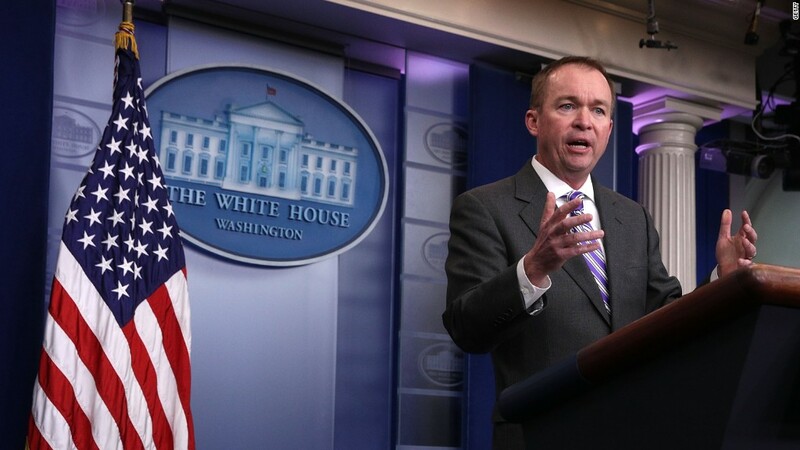 "What you should really look at is the number of jobs created," Mulvaney said on "State of the Union." "We've thought for a long time, I did, that the Obama administration was manipulating the numbers, in terms of the number of people in the workforce, to make the unemployment rate -- that percentage rate -- look smaller than it actually was." Trump repeatedly railed on the unemployment rate during Obama's time in office as a "hoax." Trump once claimed that he had "heard" the rate could be as high as 42% -- even though at the time it was about 5%. Economists debate the best way to calculate statistics. But there is no evidence that the Bureau of Labor Statistics fudges its unemployment data. The BLS is the Department of Labor agency responsible for compiling a vast store of government data about jobs that is used by businesses, economists and investors to judge the health of the U.S. economy. "During the four years I served as commissioner, the administration didn't try to manipulate the numbers at all," said Erica Groshen, who served as BLS commissioner from January 2013 to January 2017. The agency has used the same method for calculating the unemployment rate since 1940. The monthly report is based on two surveys. One queries American households to produce the unemployment rate, and the other surveys businesses about the number of jobs added or lost each month. The BLS also publishes "alternative" measures of employment each month, which include many different metrics for the public and politicians to review. Despite Trump's past feelings on the jobs report, the president changed his tune Friday after a positive showing: The economy added 235,000 new jobs during his first full month in office, and the unemployment rate dropped to 4.7%. Said White House Press Secretary Sean Spicer: "I talked to the president prior to this, and he said to quote him very clearly: 'They may have been phony in the past, but it's very real now.'" Friday's report marked the 18th month in a row that unemployment was at or below 5% -- a level considered low by most economists. -- CNNMoney's Cristina Alesci, Patrick Gillespie, Julia Horowitz and Heather Long contributed to this story.